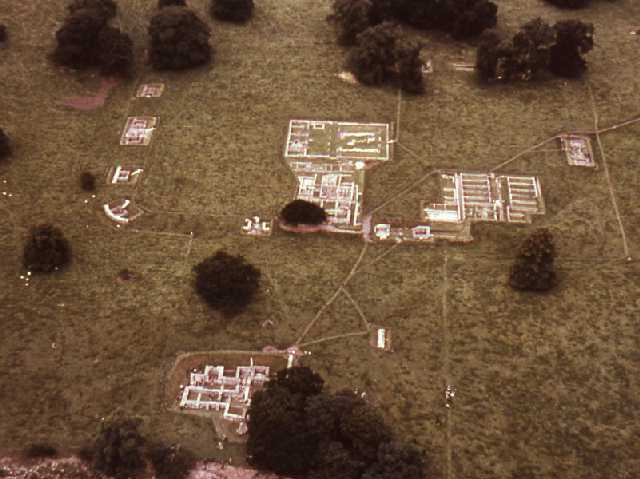 Chesters Roman Fort from the air. Copyright Reserved: Museum of Antiquities, Newcastle upon Tyne. The Roman fort at Chesters was built to guard Hadrian's Wall where it crossed the River North Tyne by means of a bridge. The fort was built after the Wall and overlies it and a Turret. Much of the fort is still visible today and it survives both as exposed walls and earthworks. For example, the fort wall in the south-east corner of the fort stands 1.9m high. Some of the buildings inside the fort are also well preserved and include the headquarters building, commanding officer's house and some barrack blocks. However, much remains buried and recent geophysical surveys have revealed a little of what lies below the ground. These include the routes of roads and traces of buildings, as well as a training circle for horses, known as a gyrus. Sections of Hadrian's Wall stand next to the fort at the east and west gateways and the wall ditch is a vague earthwork. Nearby is a large civilian settlement, or vicus, a well, bath house, and cemeteries. Chesters Roman fort is managed by English Heritage and is open to the public. This is a Scheduled Monument protected by law.